According to the National Council on Problem Gambling, the term “problem gambling” refers to the urge to gamble, despite harmful negative consequences or a desire to stop. This definition may also include the condition known as “pathological gambling,” a progressive addiction whereby a person gambles compulsively to such an extent that the activity has a severe negative effect on his/ her job, relationships, mental health and/or other important aspects of life. People who suffer from pathological gambling may continue to gamble even after they have developed social, economic, interpersonal or legal problems as a result of the gambling. Problem gambling is a widespread. Two million (1 percent) of U.S. adults are estimated to meet criteria for pathological gambling in a given year, according to the National Council on Problem Gambling. Another four to six million (2-3 percent) would be considered problem gamblers; that is, they do not meet the full diagnostic criteria for pathological gambling, but meet one of more of the criteria and are experiencing problems due to their gambling behavior. 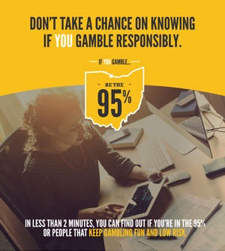 Based on national prevalence data, in Ohio it is estimated that 264,000 adults and approximately 38,000 adolescents exhibit problem gambling behaviors. Are you concerned that you or someone you know has been or is currently a problem gambler? Here are some warning signs. 3-4: You are a problem gambler. 5 or more: You are a compulsive gambler. Please consider seeking help by calling 1-800-589-9966. Contact Crossroads Counseling Services at 740-695-9447 for more information or the Ohio Problem Gambling Helpline at 1-800-589-9966. Ohio Problem Gambling Helpline Resource Directory.